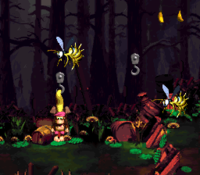 Mudhole Marsh is the twenty-first level of Donkey Kong Country 2: Diddy's Kong Quest. It is also the fifth area of Krazy Kremland. Outside of the park, the Kongs find themselves in another swamp. As Diddy and Dixie Kong tread through this swamp, they have to rely on Krockheads, platforms, and even barrels shot by Kannons to cross the dangerous waters. The Kongs meet the foes, Cat o' 9 tails, in this level. Other enemies include Zingers, Flitters, Click-Clacks, and Mini Neckies, who are scattered throughout the whole level. The Kongs hang on a hook around Zingers. The level begins on a grassy bridge that is held over the swamp water. Three Flitters attack the heroes as they walk across this area, but they can use the enemies to their advantage by jumping on them to reach a Banana Coin. A water area is ahead that they must cross by using half-sunken barrels and lily pads. A hook floats in the air above the objects. 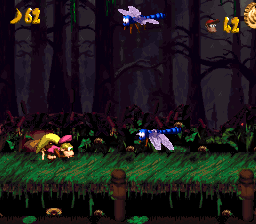 As the Kongs approach land again, Flitters attack them and they meet the first Cat O' 9 Tails in the game. It can throw them to the letter K or harm them. Another gap full of water is ahead that must be crossed with the hooks floating above it. Click-Clacks walk along a small platform ahead of here. There is another water section after this platform that can be crossed if the Kongs jump along the lily pads and half-sunken barrels in it. Mini-Neckies attack them as they cross, diving at them. A treasure chest containing a Banana Bunch is on the first lily pad as well. Once the Kongs cross the water area, they reach another small platform supported over the swamp. It has a Cat O' 9 Tails on it. Using more hooks, the primates can cross most of a long section of water after here. Zingers surround some of the hooks. A Flitter is also after one of the hooks that must be bounced on to avoid landing in the liquid. Lily pads and barrels must be jumped on throughout the remaining part of the water area once the heroes bounce on this Flitter. As the primates travel down the swamp with the lily pads and barrels, Mini-Neckies swoop down at them. They come up to a DK Barrel and many treasure chests on the way as well. As the heroes approach the end of the water section, they encounter a few Flitters, whom they must bounce on to cross small gaps between lily pads. Once they Kongs cross this water area, they reach another bridge platform supported over the liquid. It has a Cat O' 9 Tails on it, as well as a Bonus Barrel above it. There is another water area just ahead of here, which the heroes begin crossing by bouncing on a Flitter to reach a lily pad. They must continue along the lily pads and the barrels in the water to progress safely. The Star Barrel floats above the first half-sunken barrel in the water. Diddy Kong hops towards a Krockhead. A single lily pad is located after the special barrel. It is followed by another solid bridge platform. A Cat O' 9 Tails rests here. A pair of Zingers also fly in the air above the platform, guarding a group of bananas. If the Kongs travel forward, they can find another water area with more lily pads and barrels that they need to cross. Vines must also be used in this area to progress. A Kannon is on the first barrel, and the letter N is right in front of it. Three vines follow the foe, allowing the primates to reach a Krockhead that can fling them over a Zinger and onto a platform held above the water. Here, there are two Cat O' 9 Tails, along with a second Zinger, who guards bananas and a Banana Coin. A third Zinger is at the end of the platform at the beginning of another water area. Here, the Kongs must hop along lily pads and barrels to progress. A Kannon shoots at them as they hop along the objects. They pass a DK Barrel and a kannonball on the way across as well. A barrel holding a kannon that can shoot them to a Bonus Level is after the Kannon. Another platform is also immediately after it, and three Click-Clacks march along it. An additional area of water is ahead. After the heroes bounce on a Flitter here to cross a rather large gap, they reach a vine that they can cling onto. Using more vines, lily pads, barrels, and even a Krockhead, they must hop over the gaps in the water area. After they pass the second Flitter, they reach a large gap that they can cross by bouncing on a barrel shot from a Kannon nearby. A few Flitters are ahead of here that can aid the Kongs in crossing the area. A bridge platform that supports a treasure chest, containing a Banana Bunch, is right after the Kannon enemy. A small gap of water is after it, but only a green Krockhead must be hopped on to cross it. On the other side of the water area, the primates can spot two Cat O' 9 Tails and a few Zingers who fly near the letter G. There is another water area following this. Once they hop along the first lily pad and the first barrel, they find a large gap ahead of them. A Kannon is on the other side of the gap shooting barrels, so the heroes must bounce on its projectiles to cross. A Flitter flies over a gap immediately after the Kannon that the Kongs can bounce on to reach a solid platform with another Kannon on it. An End of Level Target is at the end of this platform. They must jump on it to complete the level. They can win a prize from the target mechanism if they jump on it from one of the barrels shot from the nearby Kannon. K: The letter K is in the air above the first Cat O' 9 Tails, who can throw them to the letter. They can also reach it with the Team-up move. O: The letter O is in the third treasure chest in the level. It can be opened if they throw it at an enemy. N: The letter N is in front of the first Kannon. The heroes must bounce on a barrel the foe shoots to grab the letter and bounce to safety. G: The letter G is next to two Zingers near the end of the level. It can be found on the platform just before the second-to-last Kannon in the level. The Team-up move must be used to reach it. The Kongs go to the End of Level Target with the DK Coin. Almost immediately before reaching the Star Barrel, the heroes discover a Bonus Barrel floating in plain sight above a Cat O' 9 Tails. Once they enter this barrel, either with their Team-up move or with the help of the Cat O' 9 Tails, they are sent to a Bonus Level. Here, they have to collect 30 stars in a swamp area within the time limit of 30 seconds. A DK Barrel is located at the beginning of this small area, as the Kongs' Team-up move is required to reach all of the stars. The stars are suspended above the water, which only holds a few solid platforms. If they fall into the water, they are sent back to the main level empty-handed. However, if they collect all of the stars within the time limit, a Kremkoin appears for them to grab within the remaining time. Near the end of the level, the Kongs discover a kannonball sitting on a small lily pad. They should pick it up and head across the platforms along the water. Soon, they reach a kannon, which they must load with the kannonball. Once they do this, they can enter the object to be shot to another Bonus Level. Here, they must use more kannonballs to defeat three Zingers and two Flitters that fly high in the air. If the primates defeat all of the enemies within 20 seconds, a Kremkoin appears for them to grab within the remaining time. They end the Bonus Level without a Kremkoin if they hit into an enemy, run out of time, or fall into the water. The DK Coin is one of the prizes the Kongs receive if they hit the End of Level Target at the right time. With correct timing, they need to use the barrels shot from a nearby Kannon to bounce high enough to hit the top of the target. They can win the coin if they hit it at the correct time. 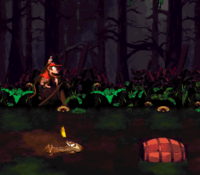 The Golden Feather is above the water directly in front of the second-to-last Kannon that the Kongs encounter in this swamp. They can collect the item with their super-jump moves, or by bouncing on the barrels shot by the Kannon. Shortly after finding the letter N, the heroes meet a group of Mini-Neckies, who swoop down at them. The foe above the other members of the group has a photograph over its head. When this Mini-Necky swoops down at the Kongs, they need to fight back and jump on it. If they manage to defeat it, they are given a photograph of a Mini-Necky for the seventh page of their scrapbook. 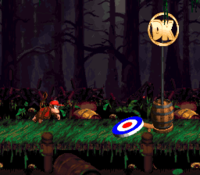 Diddy prepares to throw a barrel at a nearby Mini-Necky in the Game Boy Advance version. This page was last edited on April 18, 2019, at 22:04.